M T D N o v e m b e r 2 0 1 8 62 T i r e S a l e s a n d S e r v i c e tire market. When it came time to balance and align the tires, he would just farm out the service. "Balancing and aligning tires was the one thing I didn't do in-house," Ohanian said. "And also the one thing I really couldn't stand, partly because of dealing with four or five different tire shops in the Huntington Beach area. None of them performed the tire services to my satisfaction. No matter how great the manager was, I still had issues with the work their technicians did. "We would kill hours just taking the car back and forth, only to notice that the steering wheel wasn't straight and we'd have to take it back again. It was a lot of hours lost and we were paying a lot of money for it. "It was expensive and it still wasn't done right, but at the time I had no choice. I was willing to pay a lot to not have to deal with it, but in the end I still had to deal with it." Ohanian was near the peak of his frustra- tion when he was introduced to Flores. e two began talking and Ohanian decided he'd be better off doing tires on his own. "We made the decision mid-year last year and we went to (the SEMA Show) and spoke to the Hunter people," he says. "We already knew what we wanted." Ohanian spent last winter reorganizing the shop to accommodate the new tire equip- ment and was up and running in January. "We added an underground alignment machine that we could roll a car onto because it was flush with the ground. at was our main construction, although we had to reshuffle our li into another location and clean up a previous bay to set that up and have a more uniform look. It opened up space so we could have the nice, new equipment and a tire center." The new tire center includes the HawkEye Elite alignment machine, which Ohanian says was easy to get the hang of. "As someone who had no experience with alignments before I went to my train- ing, I was able to utilize the machine," he says. "It guides you step-by-step so anyone with a basic knowledge of cars can handle it. e training helped fine-tune it." DISRUPTING THE LOCAL TIRE MARKET So how does a body shop with no experience with tires become a competitive player in the local tire market? e answer: Joe Flores. 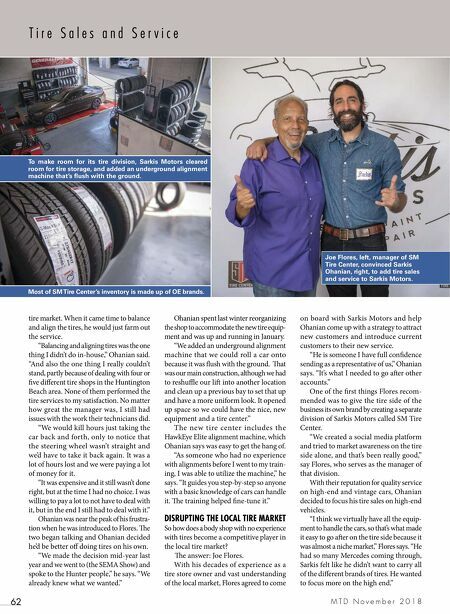 With his decades of experience as a tire store owner and vast understanding of the local market, Flores agreed to come on board with Sarkis Motors and help Ohanian come up with a strategy to attract new customers and introduce current customers to their new service. "He is someone I have full confidence sending as a representative of us," Ohanian says. "It's what I needed to go aer other accounts." 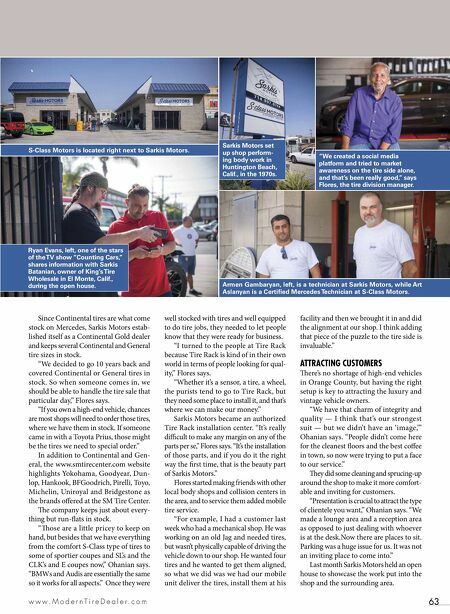 One of the first things Flores recom- mended was to give the tire side of the business its own brand by creating a separate division of Sarkis Motors called SM Tire Center. "We created a social media platform and tried to market awareness on the tire side alone, and that's been really good," say Flores, who serves as the manager of that division. With their reputation for quality service on high-end and vintage cars, Ohanian decided to focus his tire sales on high-end vehicles. "I think we virtually have all the equip- ment to handle the cars, so that's what made it easy to go aer on the tire side because it was almost a niche market," Flores says. "He had so many Mercedes coming through, Sarkis felt like he didn't want to carry all of the different brands of tires. He wanted to focus more on the high end." To make room for its tire division, Sarkis Motors cleared room for tire storage, and added an underground alignment machine that's flush with the ground. Most of SM Tire Center's inventory is made up of OE brands. Joe Flores, left, manager of SM Tire Center, convinced Sarkis Ohanian, right, to add tire sales and service to Sarkis Motors.